On March 30, the March 2012 Class and Component prices were announced. Prices continued their slide across the board. 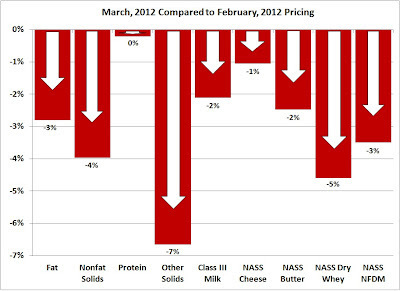 The only good news is that protein pricing was essentially unchanged at $2.66/lb. 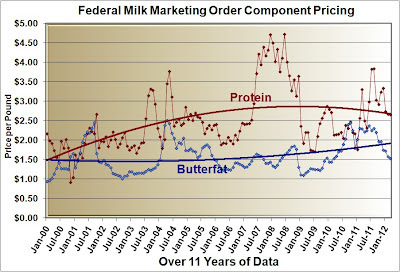 The milk protein price is calculated based on the cheese price with an adjustment for the higher value of butterfat when it is in cheese rather that butter. 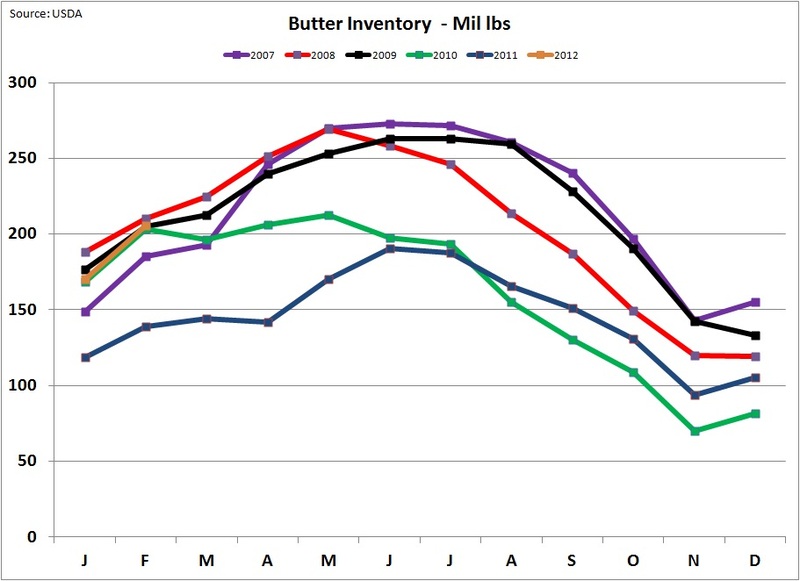 In March, the value of butter fell more than the price of cheese reducing the differential higher value of butterfat in cheese as opposed to butter. For a further explanation see the January 3 post to this blog where protein pricing is discussed. 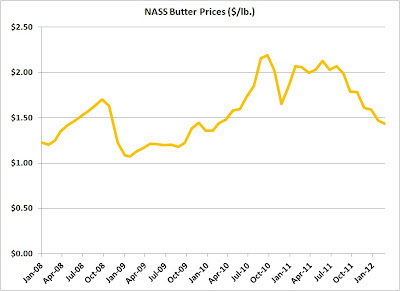 Butterfat is almost exactly at its long term level of $1.50/lb. 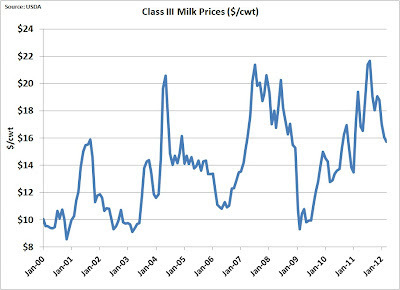 Milk protein is also near its long term price. 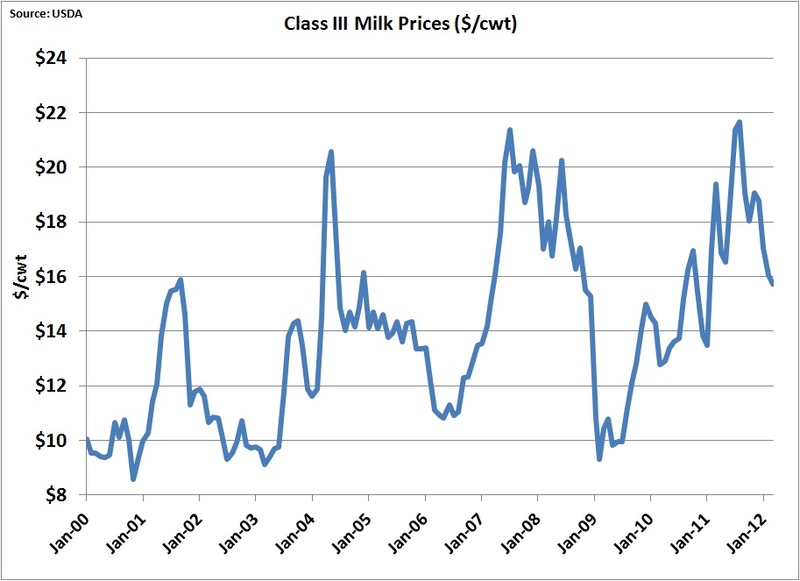 As a result, the Class III price is $15.72/cwt, which is just over the last three year average. 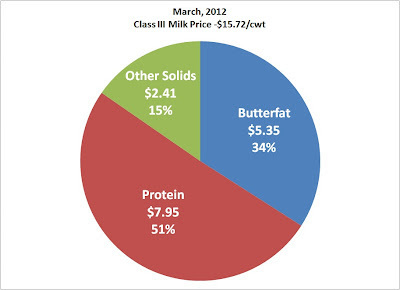 Payment for protein made up 51% of the milk check in March. 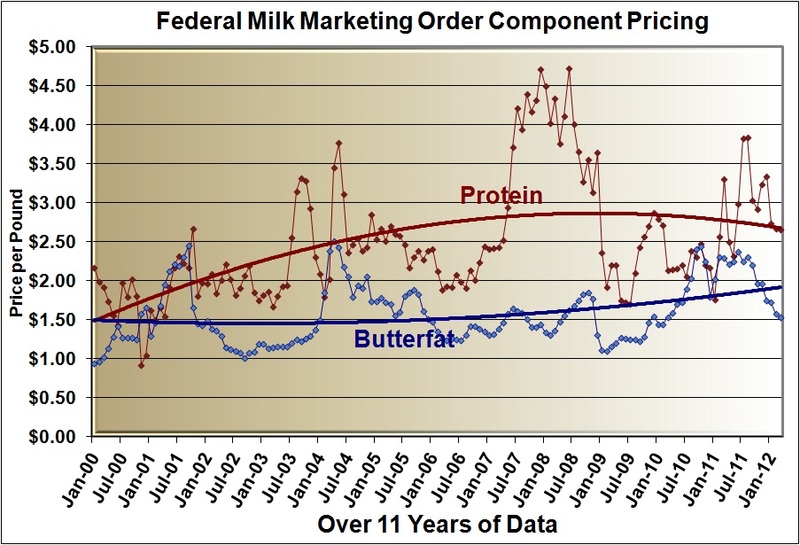 For the many producers who are paid a premium above the Federal Milk Order price for protein, the payment for milk protein accounts for well over half the milk check. 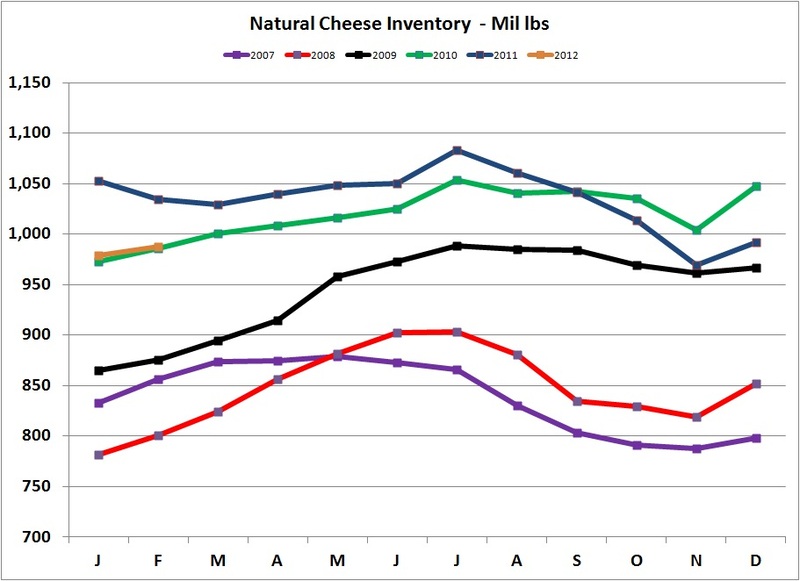 Cheese production for February and March is not officially reported yet, but as the amount of milk available at reasonable prices should have kept the cheese producers working at near capacity. 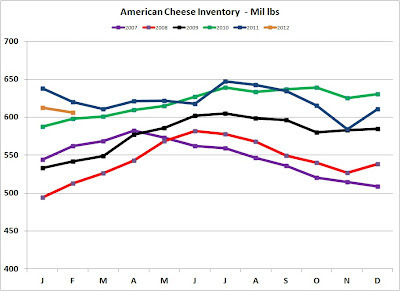 Cheese inventory data is available through February, and does not show any alarming trends of high inventories. New data on cheese exports is also not available. Based on the data available, cheese fundamentals do not seem to be out-of-line. 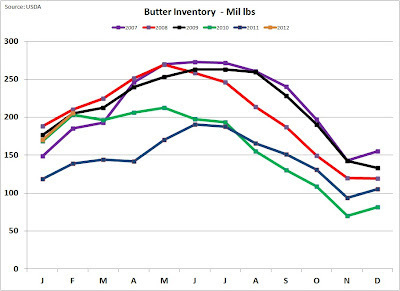 Butter Inventories in 2011 were extremely low. 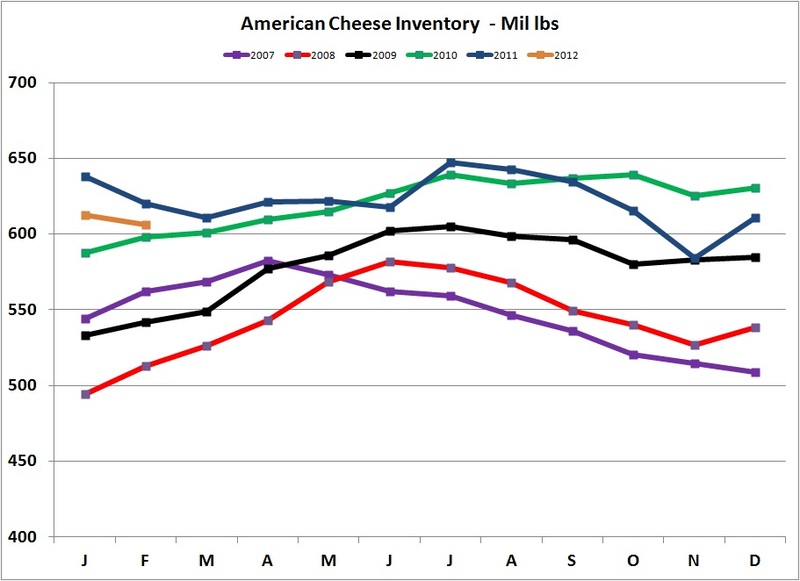 However, by the start of 2012, inventories had come in line. 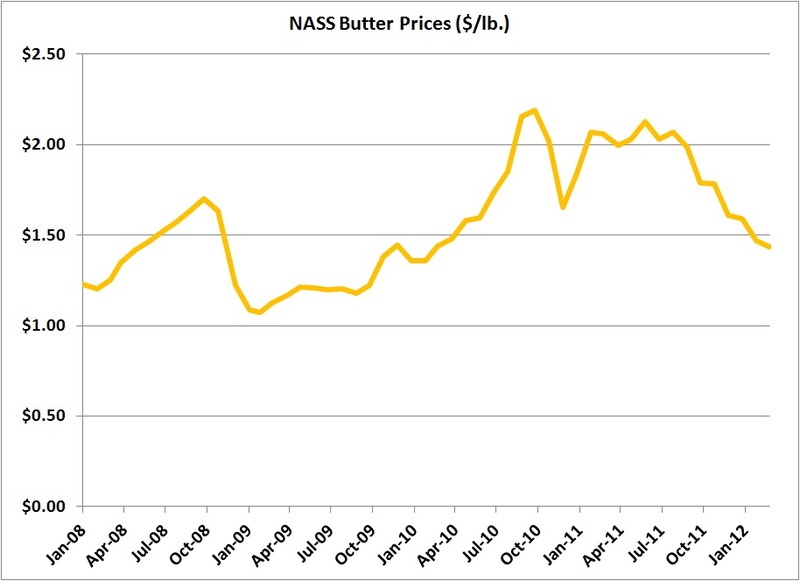 With this change, butter prices have returned to "normal" levels. Seeing a lot of red on the dashboard of dairy price movements is always alarming. In reality, prices are not far off "normal" levels and inventories do not seem out of line. Of course, high feed costs remain a problem for producers. However, there is no reason to expect any further weakening of prices. The only negative on the horizon is a growing inventory of cows and with high production, which results in high milk volumes. This may necessitate some adjustment to cow numbers which typically result in a reduction in the number of smaller producers with higher costs. Exchange rates were not discussed above, but U.S exchange rates with the New Zealand Dollar and the Euro are also not out of line. There really are no major clouds on the horizon.